Get enhanced audio quality for your favorite TV shows and movies with the Sony HT-MT300 100W 2.1-Channel Soundbar System in black. 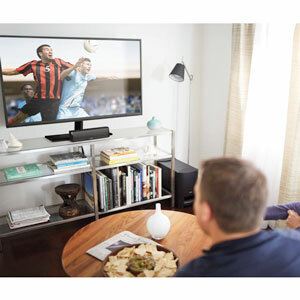 It includes a 2-channel soundbar and wireless subwoofer, both of which have slim designs to fit into nearly any listening environment. The subwoofer can even be laid on its side to fit under a piece of furniture to further conserve space. The soundbar features Bluetooth with NFC for pairing with your compatible smart device and wirelessly streaming your audio content. Its wired connections include an optical input, an 1/8" input, and a USB port for media playback from suitable HDDs and flash drives. The system can be controlled with the SongPal app or by the included remote control. The subwoofer system is designed to complement almost any space or decor, while delivering enhanced sound quality. 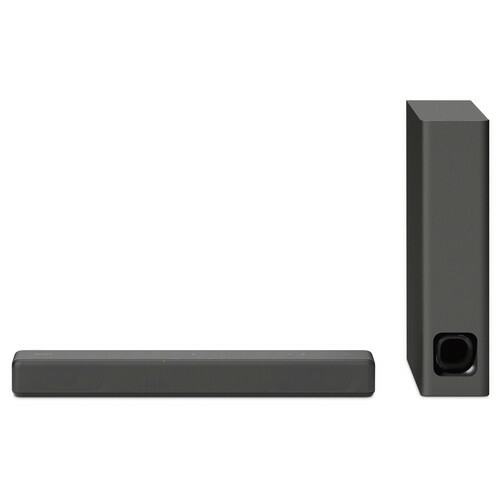 The soundbar features a low-profile design that can fit in front of most displays without blocking them. Wireless Subwoofer with "Sofa Mode"
Tuck the wireless subwoofer between or underneath furniture and still experience enhanced bass with "sofa mode". Connect and stream your favorite tracks and playlists from compatible devices via Bluetooth with NFC. Connect a compatible USB device to the USB port to enjoy audio playback. Box Dimensions (LxWxH) 22.1 x 20.2 x 5.9"
HT-MT300 100W 2.1-Channel Soundbar System (Black) is rated 4.0 out of 5 by 1. Rated 4 out of 5 by Venture from Great System I am very pleased with the Sony HT-MT300. I was looking for a system to compliment my Sony 65 inch TV. I wanted to upgrade the TV speakers. I live in an apartment, so I was not looking for a "wall shaking system". This system is perfect. Easy to install. The only thing negative to say is, you need the system remote for volume control, but I can live with that. Can you connect more Sony speakers to these for surround sound like the zr5 or zr7? This system cannot drive additional speakers.